ClanDestine tells the story of Adam Destine, a normal human turned immortal after a dream-clouded encounter with an ethereal, angelic woman. In the eight hundred years he’s survived since being granted with such overwhelming longevity, Adam has fought wars, toppled dynasties and produced more than a dozen children... each of whom has a special power or two of their own. As Writer / Artist Alan Davis’ long-forgotten pet project, ClanDestine ran for a dozen issues in the mid ‘90s (not to mention a few high profile one-shot crossovers) before being cast aside for nearly fifteen years. Like its namesake, however, the story lives on and Davis has finally returned to resume it’s telling. A good amount of this issue takes place through a series of flashbacks, which have the potential to be especially cool, considering the lead character’s rich history during landmark moments throughout human history. Those stories are kept so brief and fleeting, though, that before I could begin to immerse myself in them, the narrative would suddenly snap back to the present, abandoning the ancient tales before they’ve even begun. When the storytelling is set in the present world, it’s kept so busy and overfilled with new faces, new attitudes and overlapping storylines that I never felt like I was truly given a chance to gather my bearings. Davis is trying to cram four issues’ worth of story into the first dozen pages, and the result is a big mess. The dialog, especially during the opening battle scene, is so tough to follow and continuity-laden that it led me to shake my head more than once. Who has time to shout something like “You are more than human, but I do not recognize you as sons of Attilan... whatever your origin, you defy the will of Tral, so you must die” while being charged by a tiger/man with a scythe on an open battlefield? On top of that... Sons of Attilan, the Will of Tral, the Shalu Monastery... these are all openly discussed within the issue’s first four pages, but as a new reader I have no idea what any of them mean. How can I appreciate the importance of these events if they’re referencing a cluster of events that presumably took place in a series that was published in 1994? Davis’ artwork, sadly, has lost much of its luster. His layouts are still fairly strong, although they occasionally grow too complicated and difficult to read (he’s a big fan of crowding the panel with unnecessarily close shots of the characters in action) but his decades in the field have taught him a lot in this regard. It’s his actual rendering that’s slid recently. When he was paired with Chris Claremont on Excalibur years ago, Davis effortlessly gave his characters rich personality, individuality and depth with a minimum of strokes. It’s something that really set him apart in the late ‘80s and early ‘90s, when excessive detail was the norm, and is a lot of the reason why I remember that run with Captain Britain, Nightcrawler and Kittie Pryde so fondly. That Alan Davis has evidently been left in the past, as these artistic contributions are largely overthought and excessively complicated. While his signature dynamic action poses are still evident throughout this issue, they’re paired with an unfamiliar abundance of extra textures and unneeded details. While much of the industry has seemingly moved to embrace a style that the writer / artist helped to develop earlier in his career, he’s shifted closer to the style evidenced by the “serious” strips in a Sunday newspaper. There’s a small degree of playfulness remaining in his work, but it’s hidden deeply behind a frequently drab, surprisingly hollow façade. For years, I’ve loved this guy’s art, but it’s just not the same. ClanDestine is a classic example of a good concept that’s been allowed to outgrow its boundaries. 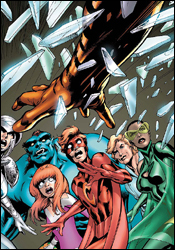 Alan Davis’s imagination remains sharp, but his self-censorship has evidently gone to lunch. On the fleeting moments that his ideas are an unbridled success, (like when Walter, the gargantuan intellectual, must use a pair of pencils to strike the keys of his typewriter) they’re quickly overshadowed by a reckless abundance of word balloons and more dangling plot threads than could be resolved in a full trade paperback. This isn’t without its moments of inspiration, but you’ve got to dig pretty deep to find them. Flip through this if you’re a fan, otherwise don’t waste your time. It’s not intended for new readers.